The Sovereign Voice launched in April 2015 as a monthly subscription publication offered to those seeking a comprehensive road map to exiting the matrix. It is authored by many of the world’s leading figures in restorative law and invites all people to submit articles of interest for inclusion. 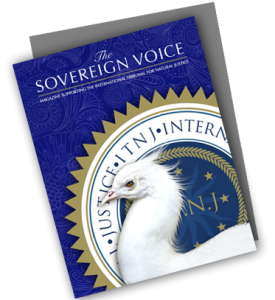 The magazine will track the historic efforts of the International Tribunal for Natural Justice as well as profile the evolution of humanity — from the ‘old earth’ paradigm of corporate dictate and total embezzlement and control of human energy and resource into a ‘New Earth’ of self-governance through the liberation of humanitarian efforts. It will avail itself as an invaluable resource of wisdom and knowledge sharing between all Peoples of the world committed to restoring freedom, natural justice and common dignity. We invite you to join our planetary effort by contributing content which might serve to assist humanity in this world-wide mass awakening. 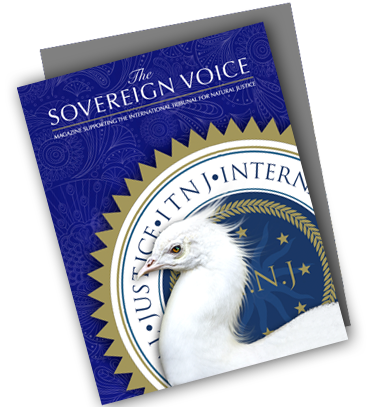 A subscription to The Sovereign Voice is offered as a Thank-You gift to all those contributing $5 per month or more.